It's never too early to start thinking about Christmas shopping! 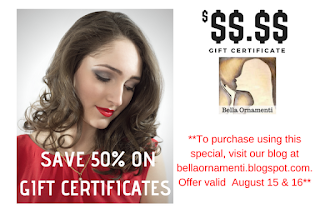 Be sure to look below the article for a money saving discount from Bella Ornamenti! The Christmas holiday season is a wonderful time of year. Filled with cooler temperatures, holiday festivities and time with family and friends, Christmas marks the largest holiday gift giving time surpassing Mother's Day, Father's Day and graduation. With this year's holiday season officially starting in less than five months, now is the perfect time to start buying Christmas gifts for family, friends and co-workers. One of the biggest challenges you may face this Christmastime is choosing the perfect gift for those on your list. Jewelry is a top choice for Christmas gifts and rightfully so. Here's to the top twelve reasons why jewelry makes the perfect Christmas gift this holiday season. • It's a girl's best friend - Not only are diamonds a girl's best friend, jewelry, in general, is vying for the title as well. Jewelry encompasses a wide range of possibilities. From stylish earrings, gold necklaces and silver chains to popular silver rings, bracelets, watches and yes, even body jewelry, jewelry is a gift that's bound to delight. • It's personal - Jewelry is a gift from the heart. Buyers spend countless hours both online and in stores each year searching for the perfect piece of jewelry. Items can be given as is, or if space is available, you can have initials and special messages engraved on a piece making it more personal as well as memorable. The back of pendants and watches as well as ring bands are the ideal place for inscriptions. • It has a "WOW" factor - If you want to woo your girlfriend or boyfriend, then jewelry definitely delivers. Nothing can elicit a 'wow' response quicker than a beautiful piece of jewelry. From fashionable Bico cross tags and pendants to stylish rings and bracelets, jewelry makes the perfect Christmas gift for this holiday season. • It has a voice - Not only is jewelry beautiful, it has an inaudible voice. Jewelry can say what you may or may not have the courage to say. "I love you!" "You're special." "Will you marry me?" are just a few examples. • It's the perfect accessory for both men and women - If style is what you're looking for, jewelry is your answer. A bracelet, choker, pendant, or ring creates a look of sophistication and style second to none. • It's an emotional and monetary investment - Often buyers see jewelry only as a financial investment but it's so much more. Giving a gift of jewelry can be emotionally taxing as well. Most buyers spend a considerable amount of time and thought in choosing the perfect piece of men's or women's jewelry to give significant others. • It can last forever - Jewelry has given a new meaning to the familiar saying 'til death do us part.' With tender loving care, jewelry can last for a very long time. In order to preserve the integrity of your jewelry, jewelry should never been worn when taking a bath, swimming or sitting in a hot tub. It's equally important to remove jewelry when using chemicals and soaps while cleaning inside and outside areas. • It's appropriate for both males and females - In terms of jewelry, what's appropriate for women is likewise appropriate for men. Common unisex jewelry includes earrings, necklaces, chains, chokers, pendants and rings. While watches are favored by both men and women, male watches are generally more bulky in style and predominately black, gold or silver in color. • It's versatile - Many pieces of jewelry such as pendants, silver chains, and fashionable necklaces are versatile allowing buyers to wear them with multiple clothing styles. For example, a simple silver chain with a pewter pendant is a stylish accessory that can be added and looks perfect with any casual, business or formal attire. In short, consider buying jewelry that is multi-purposed. • It's unique - Today, there are more choices in jewelry styles than ever before. Long gone are the days when shoppers are limited to buying jewelry only in gold or silver. Women's and men's jewelry is now available in platinum, titanium, rhodium, pewter and yes, even recycled paper and can tabs have been used to create exquisite jewelry masterpieces. With the only limitation being the designer's imagination, if done unintentionally, it is rare you will ever see two people wearing the same piece of jewelry. • It's incredibly affordable - Not only has the quality of men's and women's jewelry significantly increased over the years, so has the popularity of fashionable jewelry. With a plethora of online jewelry stores now available including sites such as Etsy.com which features hand-made items, jewelry prices have become competitively lowered. Simply stated: In terms of fashionable jewelry, it is a buyers' market. • It's popular - Jewelry has been around for tens of thousands of years with the oldest known jewelry to be 100,000 years old. Original made from bones and animal teeth, the practice of creating jewelry has stood the test of time. With shark teeth necklaces still available, the majority of jewelry today is made from beautiful gemstones, man-made gems, beads, shells and precious metals such as gold, silver and pewter. Although jewelry styles change from time-to-time, jewelry remains a popular choice for Christmas gifts, Mother's Day, Father's Day, graduation, birthdays and other special occasions.